In large skillet, combine all ingredients except cabbage; mix well. 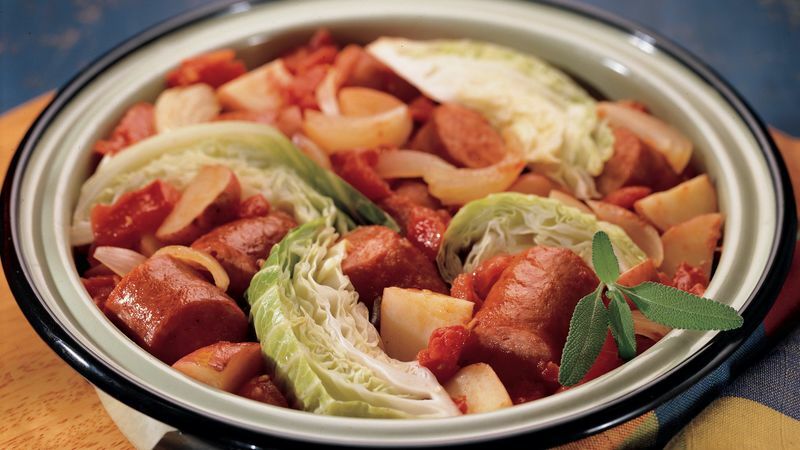 Arrange cabbage wedges over top. Bring to a boil. Reduce heat to medium-low; cover and cook 15 to 20 minutes or until vegetables are tender. Spoon sauce from skillet over cabbage wedges before serving. It turns out that the humble cabbage, a staple food of the downtrodden in many countries, has nutritional properties fit for royalty. It's a member of the cruciferous family of vegetables, which health researchers believe play a valuable role in warding off cancer. Cabbage's cruciferous cousins include bok choy, broccoli, Brussels sprouts, collards, cauliflower, kale, kohlrabi, mustard greens, radishes, rutabagas and turnips.